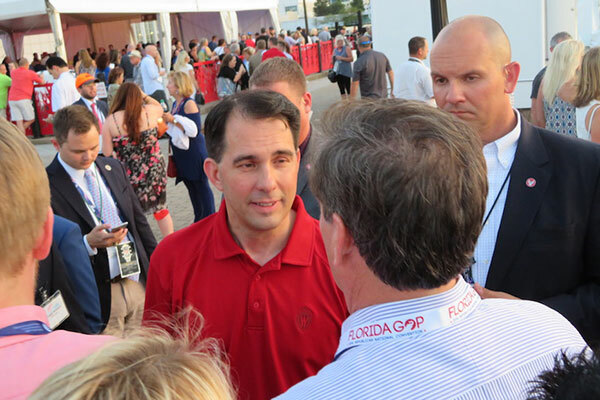 CLEVELAND (JTA) – On the Lake Erie boardwalk, a few Republican delegates huddle next to Wisconsin Gov. 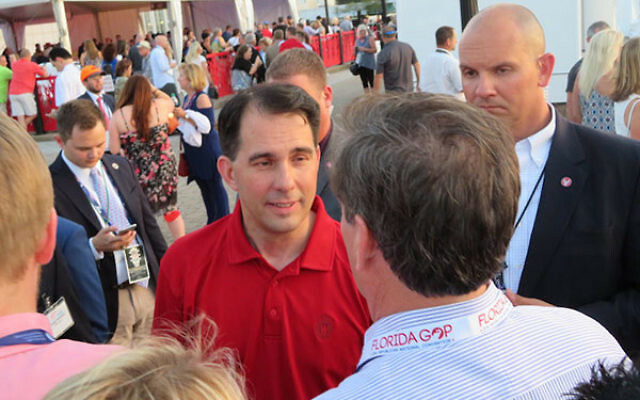 Scott Walker for a quick selfie before scooting away. Walker was the anti-Donald Trump for 15 minutes last year, until he quit and asked other lagging Republicans to rally around Texas Sen. Ted Cruz, until he, too, dropped out. The Walker selfies are almost surreptitious, husbands gently tugging away wives and looking left and right before they continue to the beer garden just outside the Rock and Roll Hall of Fame. Trumpism is visible here, but not in the way nominees and what they stand for have dominated previous conventions. A few baseball caps are visible with his slogan, “Make America Great Again,” and there are discreet buttons and a service dog named Titan wearing a Trump sticker. Law enforcement, in the wake of a horrific spate of police shootings, has become a theme, with delegates whooping cheers for blue uniforms whenever they appear. There is one subtle nod to Trumpism: a proliferation of tall young blonds who have affected the swept-over hairstyle of his daughter Ivanka. A vendor peddling T-shirts emblazoned “Trump 2016” stands forlorn on 9th Street, the main thoroughfare connecting downtown with the convention area. More interesting to the delegates are the attractions at the Rock and Roll Hall of Fame. Among the more popular exhibits is a blow-up photo of Doors frontman Jim Morrison, who died in Paris in 1971, having gained notoriety for his sexually explicit lyrics and stage performances. Baby boomer couples in pastel-colored shorts and shirts affect contemplative expressions as they pose in front of the photo. The morning after the opening night party, the Ohio delegation has a breakfast emceed by Ohio’s Jewish Republican star, Josh Mandel, the glamorous young state treasurer. An hour into the event, there are plenty of hangover jokes but not a single Trump mention — neither by Mandel nor the speaker, Sen. Tom Cotton, R-Ark., a rising star in the party and a neoconservative favorite for his robust embrace of foreign interventionism. “While we definitely want to elect a Republican the next president of the United States, what I’m focused on and what I’ll be focusing on is helping Rob Portman,” said Mandel, referring to the senator facing a tough challenge from former Ohio Gov. Ted Strickland. Trump is a different kind of Republican. The official convention guide does not feature the typical outdoorsy photo of the candidate enjoying his family. Instead there is Trump indoors, candle-lit, grasping his wife, Melania, in a décolletage-revealing dress. She stares at him worshipfully, displaying a massive diamond ring. He’s raised millions for veterans, his bio says, and in 1996 he was honored with a lunch at the Pentagon. It’s about defeating Hillary Clinton, says Sam Horowitz, 70, and his 30-year-old son, David. Both are Republican Party activists from Cleveland’s Eastern suburbs. “He’s showing signs of statesmanlike attitude,” Sam Horowitz, a broker, says of Trump. When Trump merits a mention, it’s often from a defensive crouch. “What does the Jewish Post think of Donald Trump?” a delegate from Texas asks me, poking my back, mishearing my introduction to a woman from New York wearing a “Women for Donald Trump” button. I demur, explaining the exigencies of wire service neutrality and not correcting her. “If Donald Trump is a misogynist, what about Bill Clinton?” she continues. I ask him if he’s met Trump.